BlueSky participated in FSI Deep Dive panel: How are artificial intelligence (AI) and big data changing the world of investing and does the help or impede the integration of ESG? 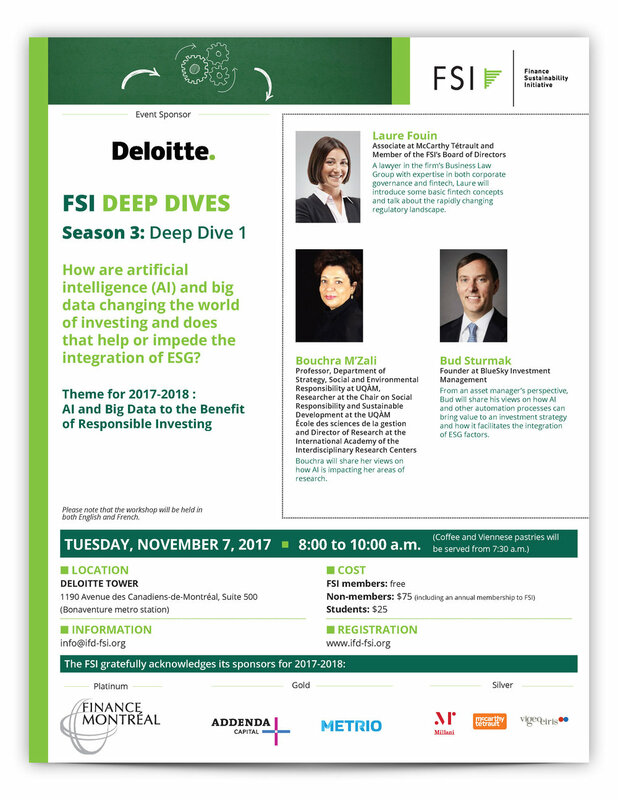 Here is FSI’s recap of the event: It’s Season 3 of the FSI Deep Dives and on November 7th, we gathered at the Deloitte Tower to discuss how AI and big data influence the integration of environmental, social, and governance (ESG) factors into investment analysis. Bud Sturmak started the conversation by describing BlueSky’s approach to integrating financial material ESG factors, which can vary across industries, into investment management decisions. There are challenges in using ESG data, most notably, the inconsistency of metrics across companies. Also, data is often backward looking and may not be a true reflection of a company’s current potential. Think of a spill or privacy breach in the past that has led to a tightening of operations and improved performance. Translating ESG data into measurable value creation allows investment managers to identify potential in companies that would have otherwise been overlooked with traditional approaches. Bud believes the BlueSky approach to assessing financial materiality will become more mainstream as investors see that considering ESG factors improves long-term performance and reduces business risk. As more data points become available, the challenge is to develop the right analytical approach and tools.